French vintage decor is always in style and it looks great in any kind of home. Whether you live in a city home or a country cottage, French vintage decor always looks comfortable and elegant and it lets you bring your own personal touch to your space. 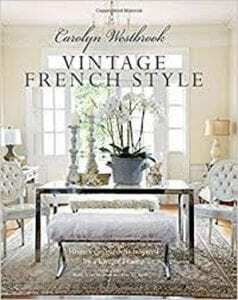 These new books are packed with inspiration to create a welcoming home with the charm of vintage French decor. And don’t forget that you can buy vintage French furniture and home accents on our website, too! Curl up with a croissant and a café au lait to get you in the mood, and enjoy! Mixing old and new is a basic element of making vintage style work successfully, and Westbrook also shows the reader how to combine and display your collections and precious items such as vintage store finds to inherited heirlooms. We agree with every word! 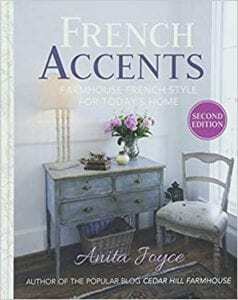 In her new book, Anita Joyce shows how to create the warm elegance of classic French style, including a tutorial for making Joyce’s own French bedspread! 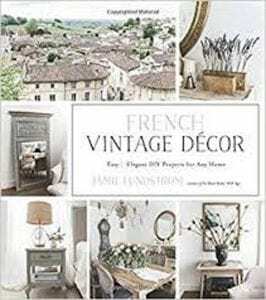 Jamie Lundstrom gives us even more Do It Yourself projects to decorate our homes in true French vintage decor style. The 70 clever and beautiful tutorials with lots of photos include how to make dried flower ornaments or a flower garland or display plants in a mock ‘cast iron’ planter Perhas you’d like to know how to crochet pillows packed with French appeal or make a baguette bag with a drawstring? Decoupage, drippy candes, rusted frames…. the author has many tricks to help you create your own rustic and vintage style French decor and add a little “Je ne sais quoi” to your home. This entry was posted in Bookshelf and tagged books, decorating books, design books, design inspiration, French Antique Furniture, French Vintage Furniture, home decor, interior decorating resources, interior design books, living with antiques, vintage, vintage crafts, Vintage French furniture on September 4, 2018 by admin. 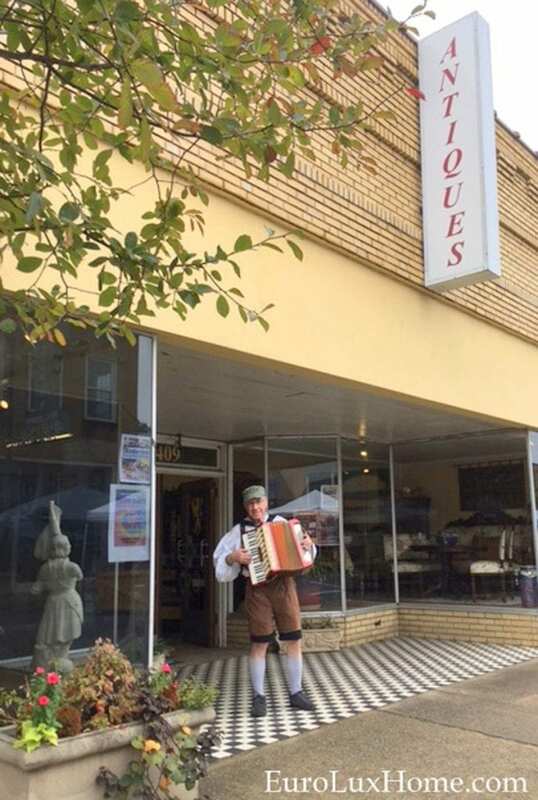 We are convinced that our local Newberry Oktoberfest is the best in South Carolina, giving us all a chance to celebrate our German heritage in historic Downtown Newberry. I hope that you will come visit and see for yourself one day, maybe even this year? 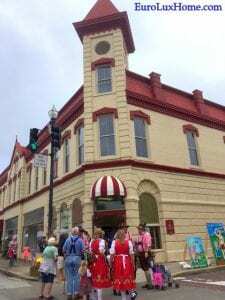 The Newberry Oktoberfest party fills the streets on the first Saturday of every October, which means that for 2018, we are celebrating on October 6 from 10 am to 6 pm. The entertainment is free and everyone is welcome. 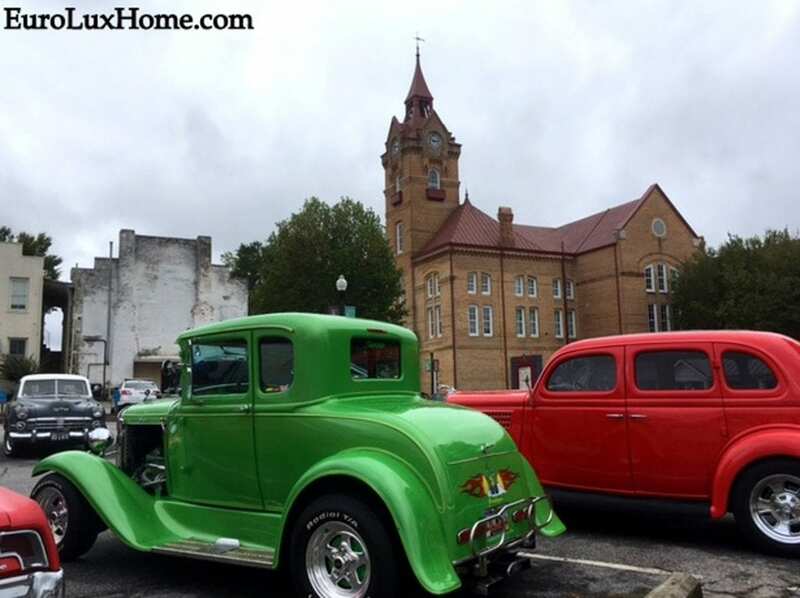 We have a small town vibe and we are known as the City of Friendly Folks for a reason…. we love meeting visitors and you’ll be given a warm welcome! 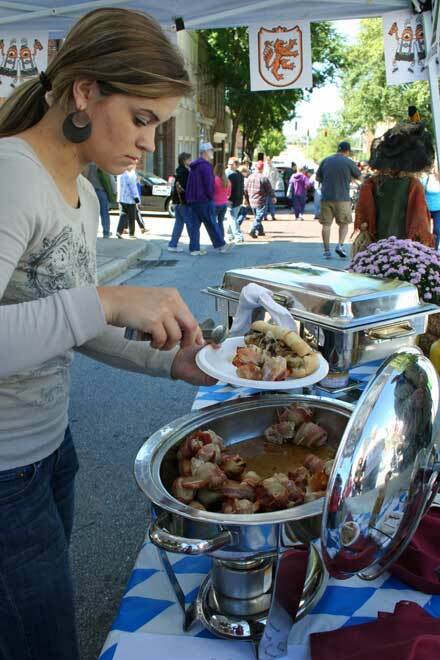 If you want to know what to expect at Newberry Oktoberfest…. read on! I took these photos in previous years, to give you a taste of the event. Many people dress up for the occasion and there is also a hotly contested Best German Traditional Dress Contest. This handsome couple certainly looks the part! The Oktoberfest festival is a wonderful oompah party with free entertainment including polka music. This year the music includes old favorites the Three Dot Polka Band and the Reggie Sullivan Band. You can also enjoy free puppet shows at the Ritz Theater. Greg especially loves the annual Midlands SC Muscle & Classic Cars show. Don’t miss the Oscar Meyer Wienermobile! And of course, we all enjoy a few cold beers in the biergartens and all the delicious German food, such as schnitzel, sauerkraut, bratwurst, German potato salad, liver nips (liver dumplings) and lots of sweet treat baked goods. Kids have fun with free activities in Kindertown, including carousel rides, a 50-foot obstacle course, an inflatable fun park, human bowling, face painting, a rock climbing wall, and crafts. Arts and crafts vendors will also line the streets, selling all kinds of interesting and unusual items. 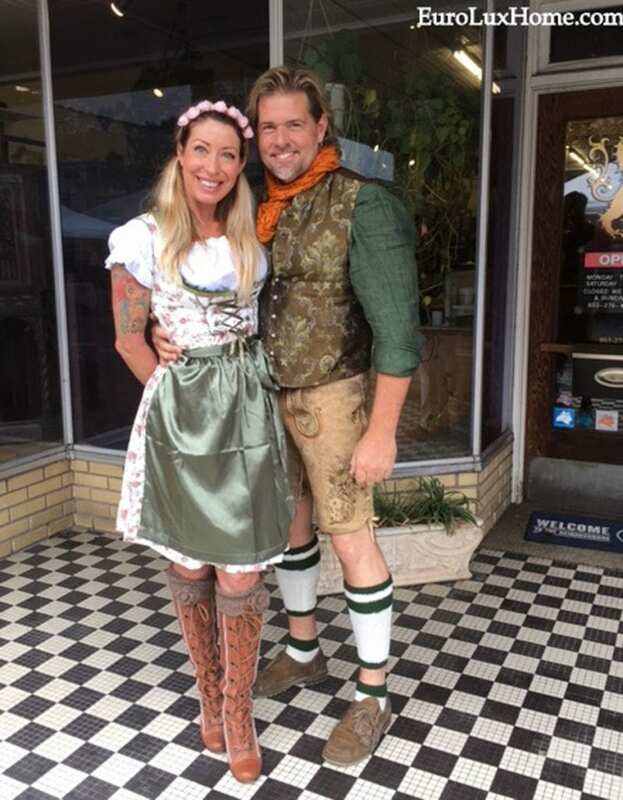 If you are in the area during Oktoberfest, come on down, sing, dance, eat and have fun and wish us all Prost! 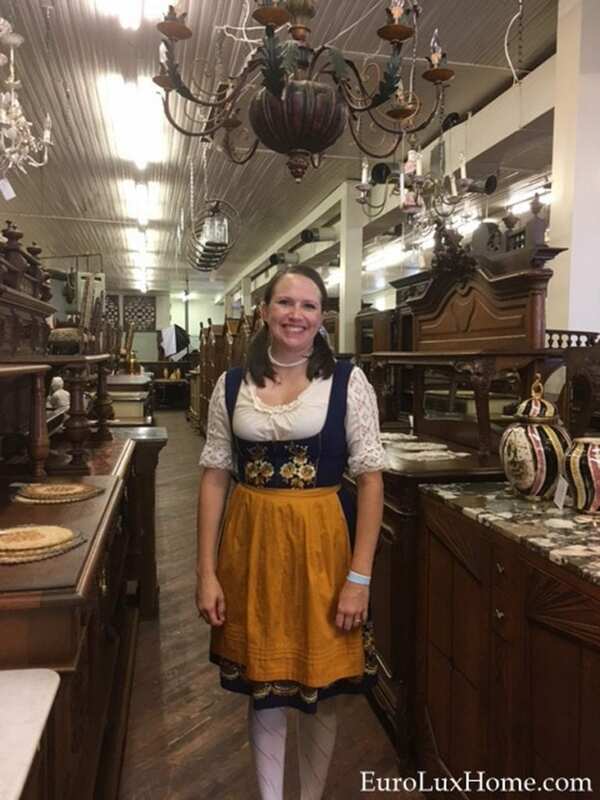 This entry was posted in Holiday Fun and tagged Antiques in Newberry, Antiquing in Newberry, Oktoberfest, Oktoberfest Newberry, Oktoberfest Newberry SC, south carolina antiques on September 4, 2018 by admin. 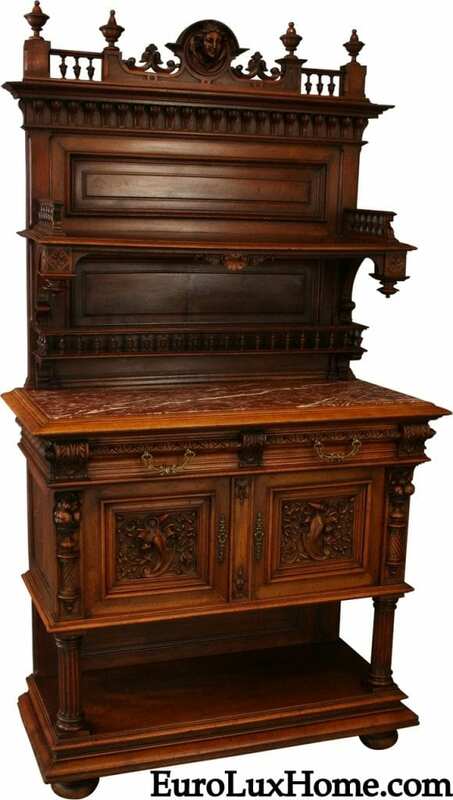 What is the Renaissance Henry II Style of Antique Furniture? 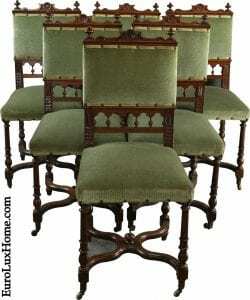 If you are looking for a handsome carved antique buffet or dining chairs for your traditional dining room or great room, then you will definitely want to know about the Renaissance Henry II style of antique furniture. You can also check out some regal Renaissance Henry II furniture for sale on our website. The Henry II style of antique furniture was influential for much longer than the brief twelve year reign of this King of France from 1547 to his death in 1559. This important furniture style lasted through the reigns of five French monarchs. 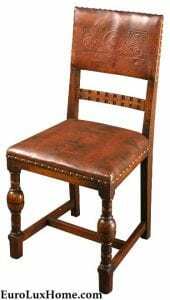 But the antique Henry II furniture we sell today in this style actually dates to the Renaissance Revival period in the late 19th century, when this very traditional look returned to favor. Furniture in the Henry II style displays the values and aesthetics of the Renaissance, which means rebirth. This rebirth of classical arts and philosophies of ancient Rome and Greece arose in Italy in the 15th century and spread across Europe, influencing architecture and the decorative arts. Typical decorative details evoked Greek and Roman mythology and architecture, with an emphasis on classical symmetry. You can see the symmetry in these lovely antique Renaissance Henry II style dining chairs crafted in wood and dating to 1900. 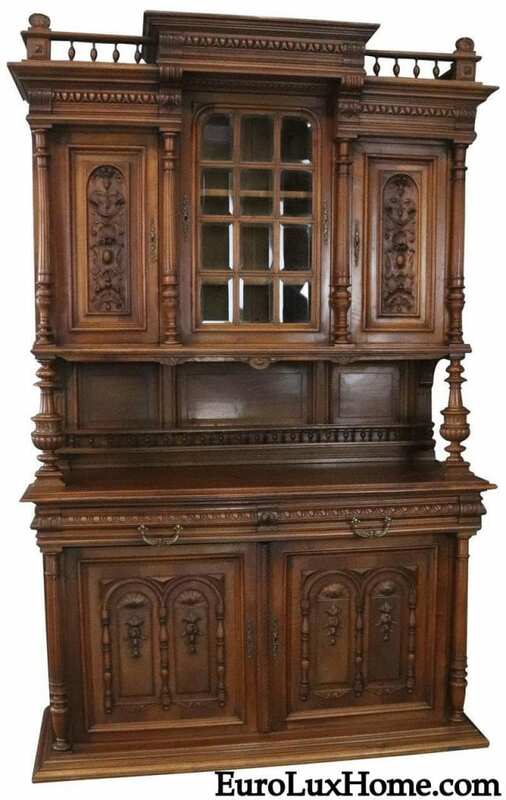 Furniture is also adorned with carved arches and columns, stately pediments and attractive finials. Figurative carvings include male and female figures, faces and heads. For example, this gorgeous antique French Renaissance Henry II sideboard or server boasts a crowned Queen carved at the top. Antique French buffets or servers in the Henry II style are often crafted in beautiful oak or walnut wood, with a rich patina from more than a century of age. The typical buffet will boast columns and spindles, including spindled galleries to serve as plate racks. However, there are many varieties of decorative designs on these unusual pieces. The furniture also was influenced by the Hunting style, which was led by the French fashion to furnish hunting lodges and chateaux with furniture carved with images of rural life. Here are some piece of furniture in this style that customers have bought from us. They sent us some wonderful photos showing the furniture in their homes for our customer spotlights. Our customer Kathleen in Oklahoma bought this French antique nightstand in the Henry II style and she made the clever decision to use it as a kitchen cabinet, providing extra storage and display space. The geometric walnut marquetry and lovely turned legs are nicely set off by the gray marble top and it looks terrific in her kitchen! See more photos and Kathleen’s full story here. Henry II style buffets often have bas-relief figures or scenes on the doors. This is a great example, from our client spotlight: Renaissance Chairs and Buffet in Chateau Home, Illinois. 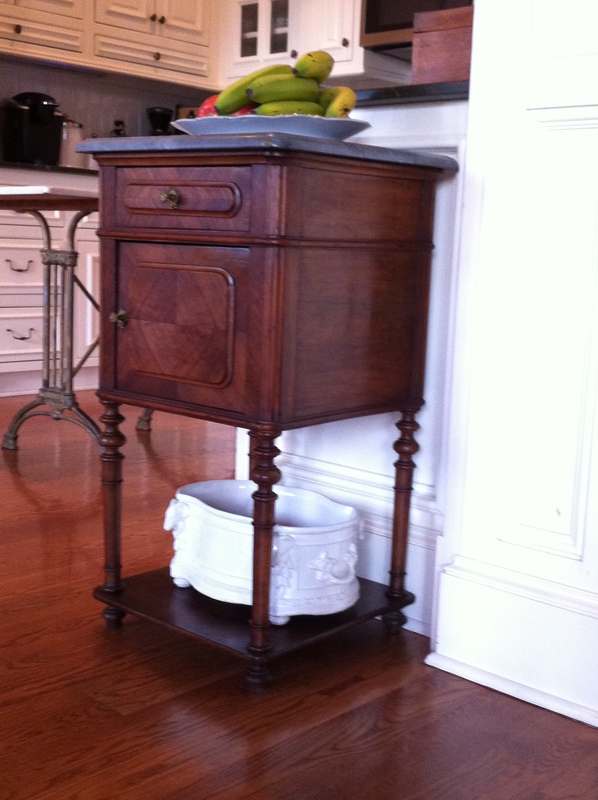 Bob H. in Prairie Grove, Illinois, bought this buffet for his French Renaissance chateau style home. 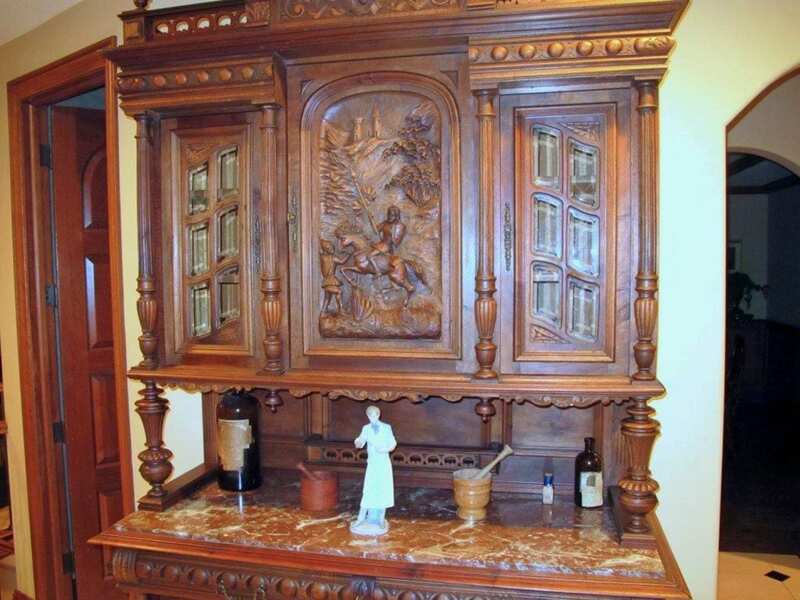 The beautiful buffet is carved with a knight on horseback on the doors. Bob decorated the marble top with a vintage porcelain figure of an apothecary and antique mortar and pestle sets. Can you guess he worked as a pharmacist? 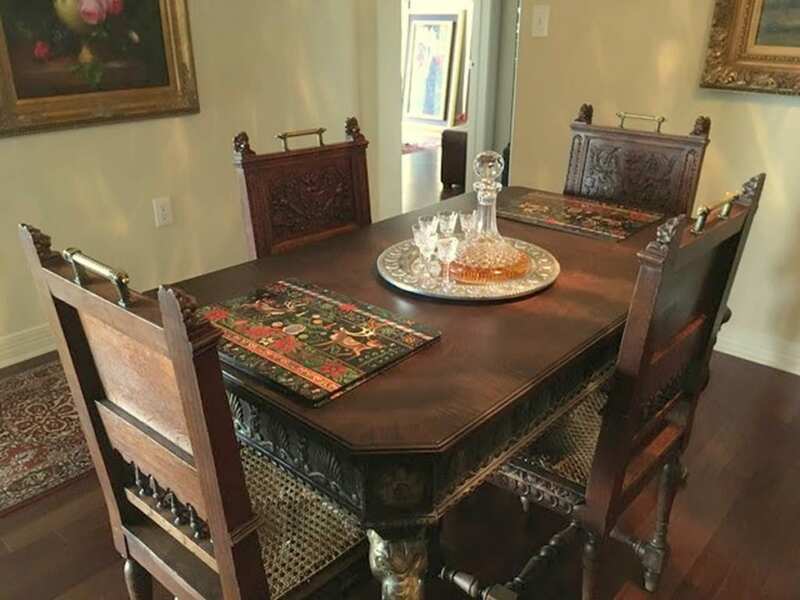 Iris in Texas bought these oak Henry II dining chairs from us, featuring carvings of birds, and a pair of lions gazing out from the finials. The attractive brass handles are also typical of this style. Renaissance Henry II style antique furniture is all elegant and classically appealing, showing the high quality taste of kings! 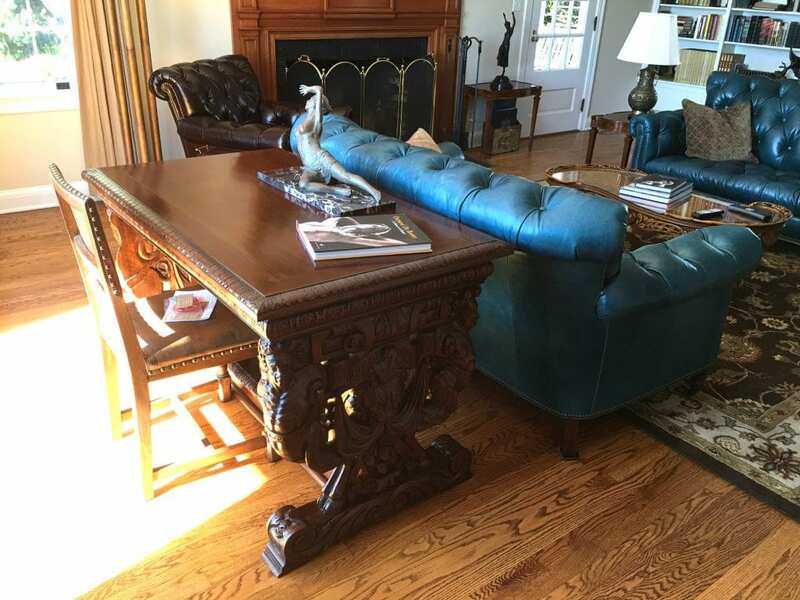 This entry was posted in Learn History & Styles and tagged Antique Buffets, antique french buffet, antique French furniture, Antique French Renaissance Henry II Style Buffet, Antique Henry II nightstand, French antique dining chairs, French Antique Furniture, King Henry style on September 1, 2018 by admin.